GrowNYC works with corporate groups of any size on outdoor volunteer projects all across New York City. 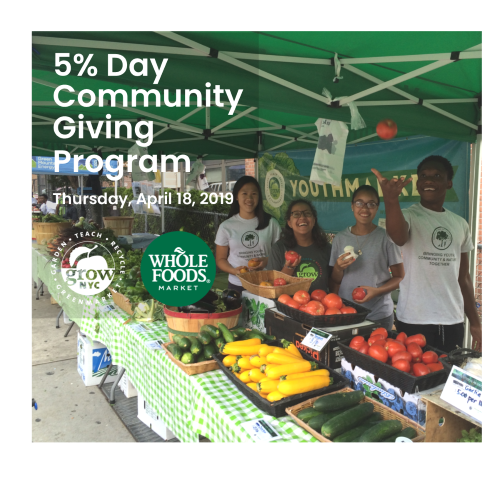 Building urban farms, planting in community gardens, and working major events and street fairs are all activities volunteers with GrowNYC take on, and we'd love to work with your team. Our volunteer opportunities are designed to be team building activities that are fun, lively, and get your hands a little dirty. Whether it be planting flowers at a school in the South Bronx, staffing a recycling event in Jackson Heights, tackling a garden cleanup in East Harlem, or helping us tend to our new farm on Governors Island, we'll try to find a project that fits your needs. 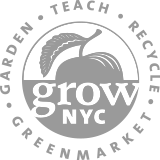 Interested in volunteering with GrowNYC? Contact Mike Rezny by using our contact form, calling (212) 788-7935, or emailing mrezny@grownyc.org. 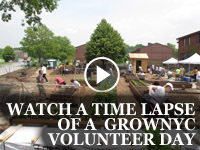 Watch a time lapse of a GrowNYC volunteer day below. GrowNYC's corporate volunteering program worked with more than 2,000 volunteers in 2017, putting in 7,500 hours at 25 different gardens across the city. These volunteers worked on building brand new gardens, refurbishing old gardens, working at our spring plant sale, building rainwater harvesting systems, and much much more. Altogether, GrowNYC build 10 brand new community gardens in 2017, giving the city 40,000 square feet of new green space for growing food, community meetings, and youth development.